Wanda Lou Evans McDonald Cox, 82, of Mayflower gained her heavenly wings, April 14, 2019. She was born June 6, 1936 in Old Austin, Arkansas to the late William Owen and Hazel Evans. Wanda was a military wife; and of the Methodist faith. She enjoyed sewing, quilting, gardening and reading; but most of all she loved spending time with her children, grandchildren and great grandchildren. Wanda was a cook for many years at Stroud's Country Diner in Mayflower. She was preceded in death by her parents, two husbands, John McDonald and Elvis Cox, three sisters, Carol Shaw, Sammie Jean Evans and Freda Marlene Evans. 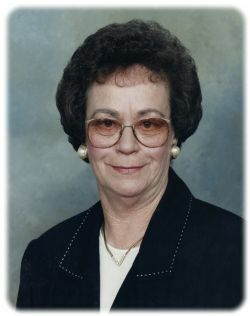 Wanda was survived by her son, Eddie (Karen) McDonald, two daughters, Janice Johnson and Donna (Jamie) Neal, four grandchildren, Samuel Johnson, Austin (Britain) McDonald, Kaitlyn (Tyler) Ryals and Wesley (Misti) Neal, three great-grandchildren, Turner McDonald, Amelia Ryals and Kai Neal, four brothers, Johnny Ray Evans, Bill Evans, Jim Evans and Chock Evans, two sisters, Sherry Jerrell and Ione Mitchell and many more family and friends. The family would like to extend a Special Thank you to the staff at Salem Place Nursing and Rehab for their loving care, friendship and support. A Memorial Graveside will be 11:00AM Friday, April 19, 2019 at Mayflower Cemetery. In Lieu of flowers donations can be made to Salem Place Nursing Home Activities Fund or a Charity of your choice.